This week I thought I'd bring a couple of cheeky little poodle puppy softies on the picnic with me. I have a naughty little white poodle called Matilda who lives here with us. Because friends know I adore her, I've been given a couple of dear little poodle softies. They are very sweet and live on my dressing table. 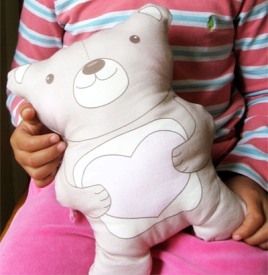 Do you have a teddy or softie to bring on the picnic this week? Please pop your details into Mr Linky and join in the fun. for Stitcheries and an adorable little softie. 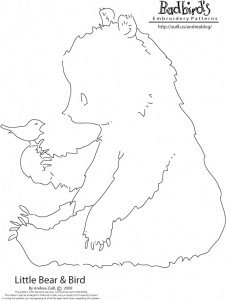 This dear little teddy is a free stitchery pattern on Andrea Zuil's quirky blog Badbirds. Thanks Andrea. Cindy from Skip to my Lou is so clever and this easy project is wonderful. It would be a fabulous project for a beginner sewer. They are so cute. The real ones as well. That's why they get away with their naughtiness. Our Sophie is an expert too! I love their spots. They sure are pretty puppies and will get along fine with the bears so long as they don't steal all the treats. Thanks for sharing the links today. Very chic and French, Melody. And rather adorable, too. Some softies have real character and I can see why these are special. The poodles are very sweet and I'm sure they will protect all the bears on the picnic. Those poodles are too adorable! What sweet little poodle softies. Would you believe I have never met a real poodle before. Oo la la Madame, Your poodles are c'est magnifique! Such adorable little poodles ,sorry I didn't make it to the picnic this week it has been a busy one for me . I love those little poodles. I am always on the look out for poodle collectables.Thank you for sharing them with us.